First one here has a bunch of things I'll be keeping! 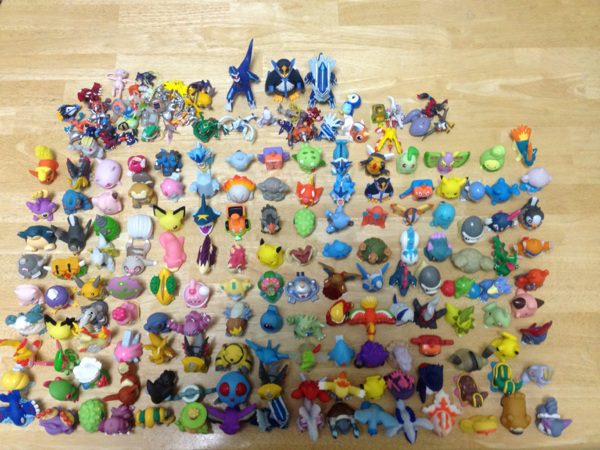 While I do have 2 Flygon chocoball figures, I don't like the paint jobs on either of them so hopefully the one in this lot is better XD I'm pretty positive I don't have the big Bulba keychain in the front, and I definitely don't have the Venu/Bulba paired keychain just to the right of the big one or the shiny green figure. The blue figure and the red one in the back I can't identify in the picture. 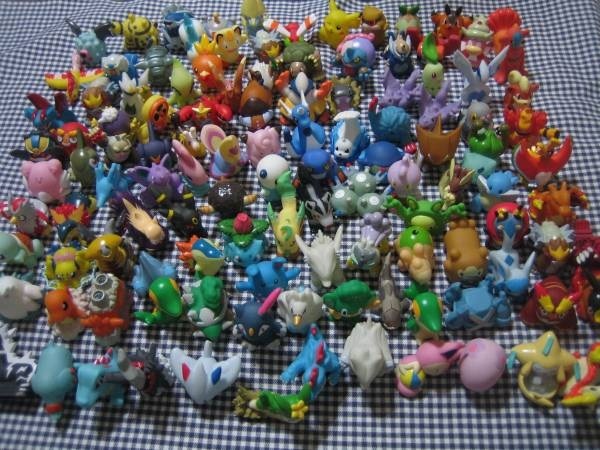 I don't have the Dragonite figure or the Dragonite/Pika keychain!! The keychain Dragonite looks adorable, can't wait to see it in person. 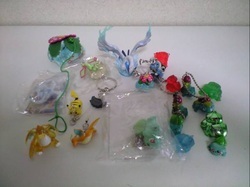 Another highlight of this lot is the super rare Venusaur Bell keychain plush! 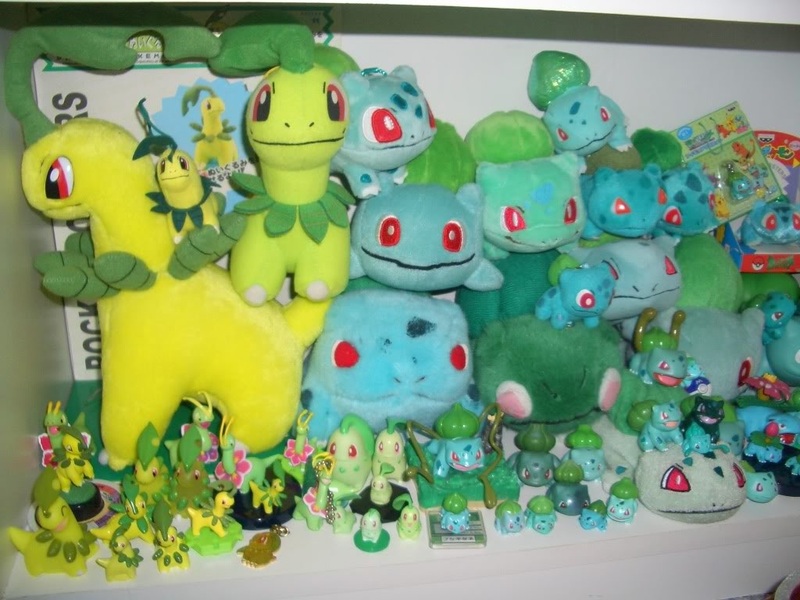 I do keep some Venusaur things when I get them, and as much as I would like to keep the bell plush, I should auction it off ;-; Everything else in there I'll be selling. How about some shiny kids?! Everything here will be sold/auctioned. 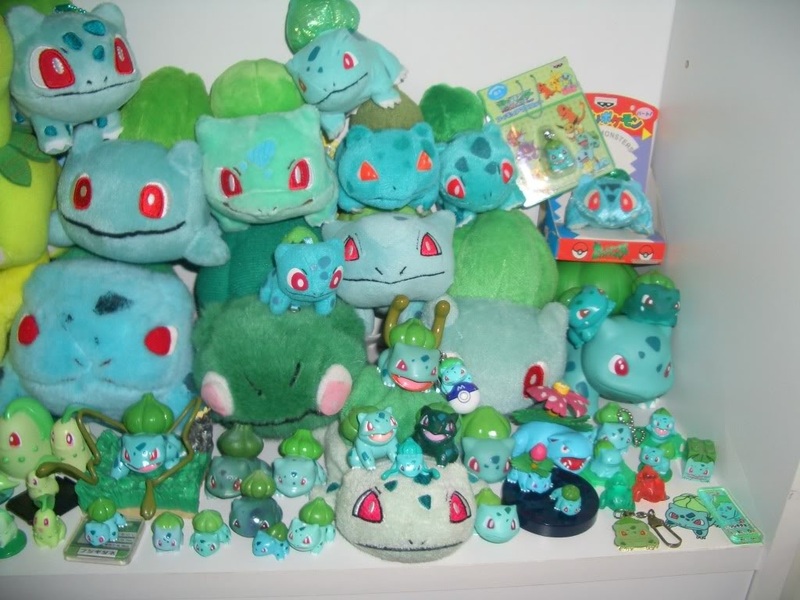 I have a shiny Flygon and Bulbasaur kid already so I don't need to keep these! This lot is huge! XD Aaaand will be a killer on international shipping ;__; I'm excited to go through it! Every time I go back to look at the picture I find something else I hadn't seen previously. 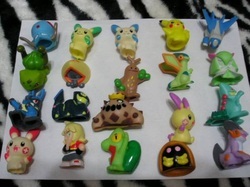 When I first saw the lot I was hoping for a Flygon or Bayleef bell keychain, but I'm pretty sure they're not in there :( The bell keychains in here are all from the first couple of sets, and not the ones Flygon or Bayleef are in. THE SEARCH CONTINUES. 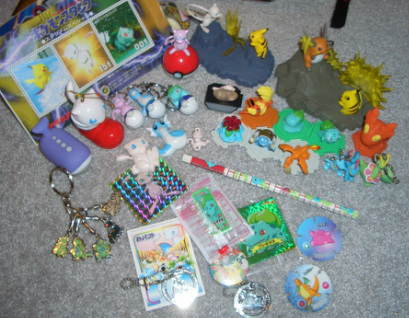 Anyway, there's a Dragonite keychain toward the bottom of the pile that I don't have yet, and a little above him is a Flareon bell keychain. 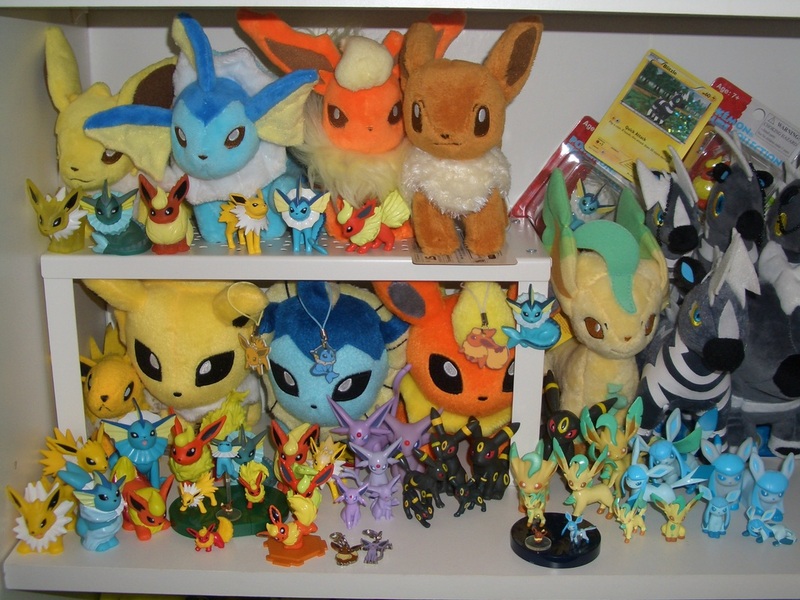 I'm sure if I auctioned that I get a good amount for it, but I'm torn since I do collect Flareon.... 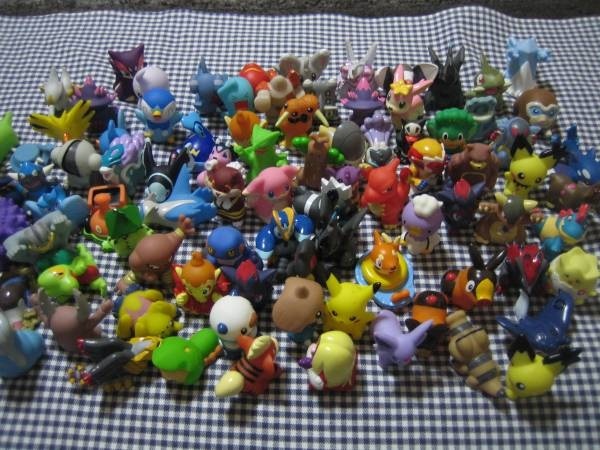 There's a Bulbasaur stamper in there on the left (on top of a big Pokeball) that I don't have too! Looks like all my recent posts here start off with how I have been really bad at updating this. Trend is not breaking yet! I'm still terrible. Anyway, here's the rest of the pictures I had promised in the last update. They're a little outdated now but OH WELL. So there you go, my Drifloon, Dragonite, Flygon, Bulbasaur, Bayleef, Zebras, and a few mini collections of other Pokemon I like. 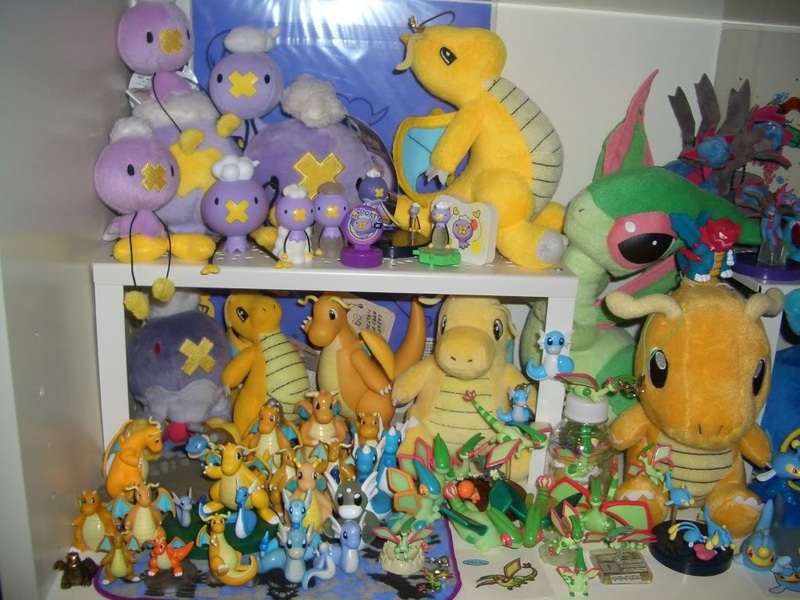 I took out a couple of Dragon type figures and plush to go with the Year of the Dragon clearfile I bought. That thing has some adorable art on it btw @__@. Also, don't you love the Zebras? Their merch has died off since last summer :(!! 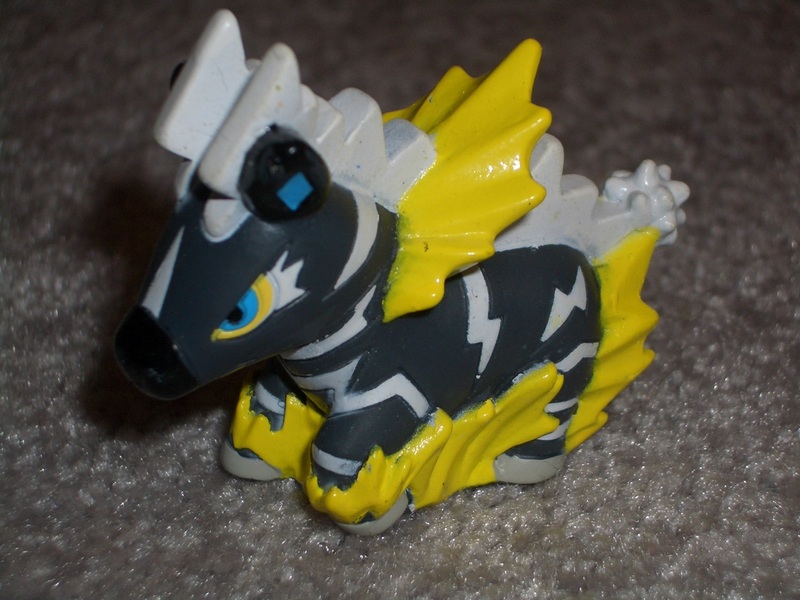 THe only new Zebra item in the last year has been the one Attack Zebstrika Kid. They need to make more!! Ended up being too busy over the weekend to post, sorry! 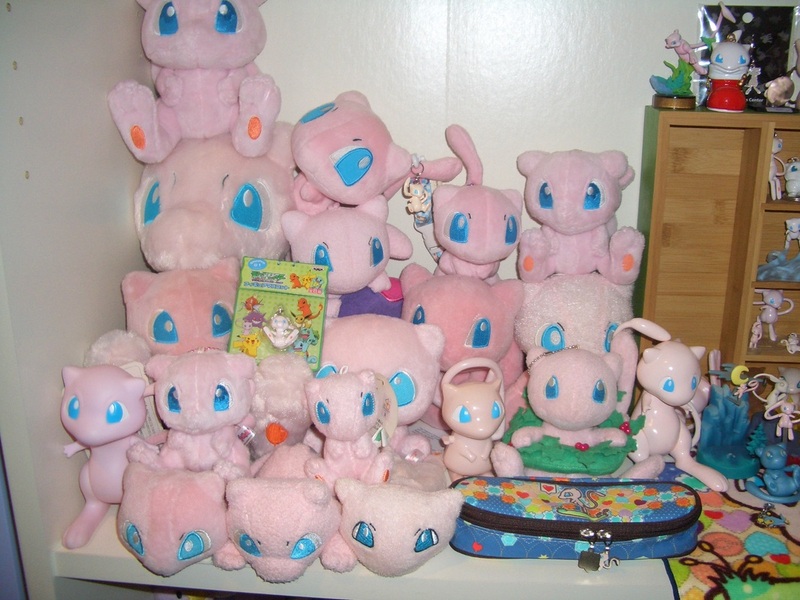 First up, here's my current Eeveelu collection! Not pictured are my Eeveelu charms, minus the Espeon and Eevee that got separated from my charms box. 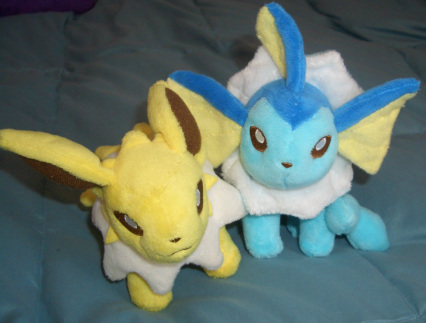 I was going to sell them, then changed my mind :P Im not much of an Eevee person, but the Canvas plush was really cute so I caved. I got a new bookcase, so I;ve been rearranging my collections. 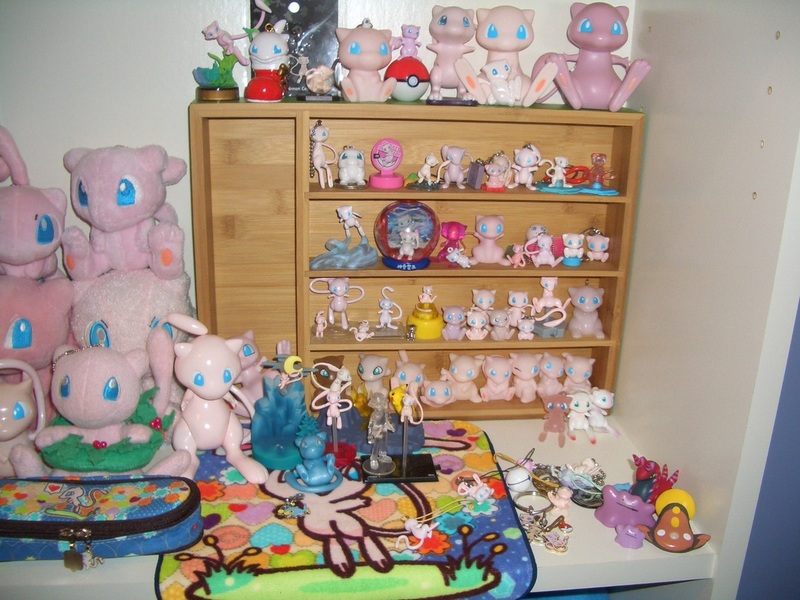 My Mew figure shelf is still WIP, because I've been too lazy to finish setting up the charms/straps! I need to go out and buy some push-pins to hang them up with. Like the Eeveelus, my 2012 dex charm is not displayed. These are all from community members :) I've gotten other things too, but I didn't take pictures of them / it would be a pain to get to them on my collection shelves / they're packed away. Tomorrow I'll post some pictures of my current shelves, and group shots of my collections! Noppin: Flareon and Eevee Canvas (completed my 1st Gen Vee set! 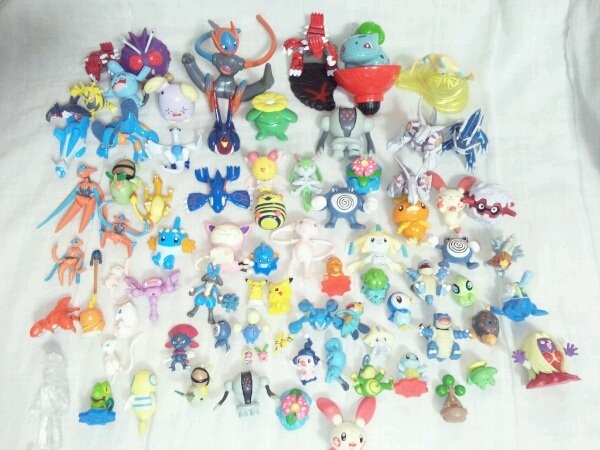 ), Toy lot, 216 Kids lot, Mew Stylus, Giggling Mew Charm, Umbreon/Espeon Chupa figures, Little toy lot, Leafeon Palace figure lot, Glaceon Palace figure lot. The last 4 have had their pictures taken off the Y!J auction listing, so Ill just put what I kept from those lots and a few other recent purchases at the bottom. 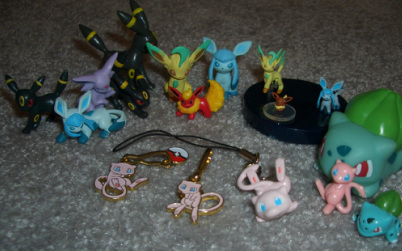 Like I said, some of the pictures aren't up anymore so here's what I kept from them, along with other new Eeveelution buys, and new Mew charm from the same line as the giggling Mew that I got from a pkmncollectors member. Glaceon Chupa was in a lot from a previous blog entry. 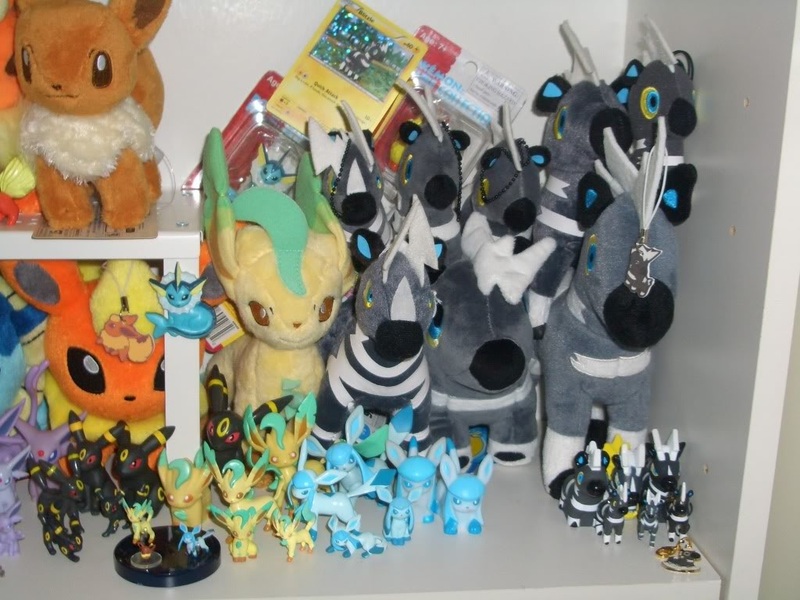 From left to right: Umbreon Chou Get, Glaceon Chupa, Espeon Chupa, Umbreon Chupa, Umbreon TOMY, Leafeon Palace, Flareon Mini Figure, Glaceon Palace, 4th Gen Vee zukan, Bulbasaur Kid, Giggling Mew charm, Normal pose Mew charm, Lucarion/Mew figure charm again from before, Mew Mini Figure, Bulbasaur Mini figure. Such a busy season! And of course since its Christmas, I wasnt buying things for myself during December :P My Noppin box came in 3 days before Christmas, so that was a ton of stuff to sort through and enjoy. The main attraction in there was the mystery lot!!! 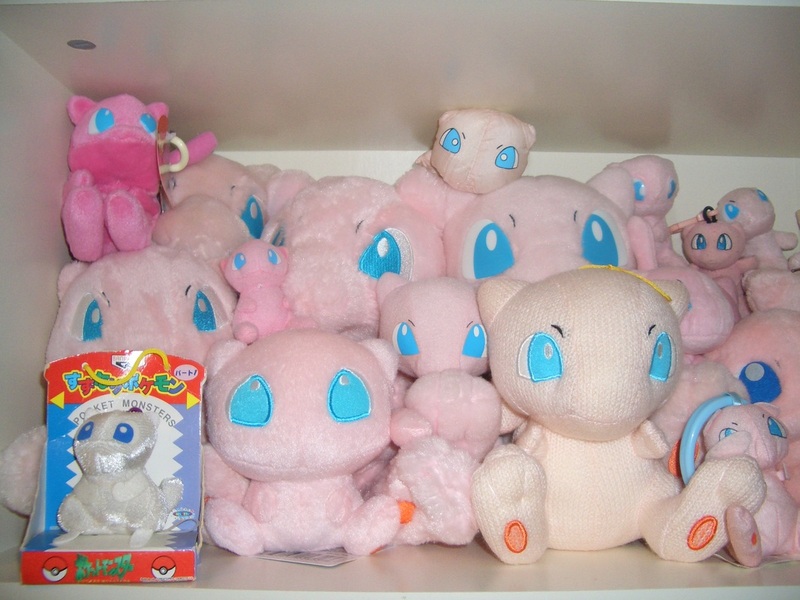 It turned out to be all 1st and 2nd Gen stuff... which means new Mews, Bulbasaurs and Dragons for me! Below you can see most of the stuff I kept. 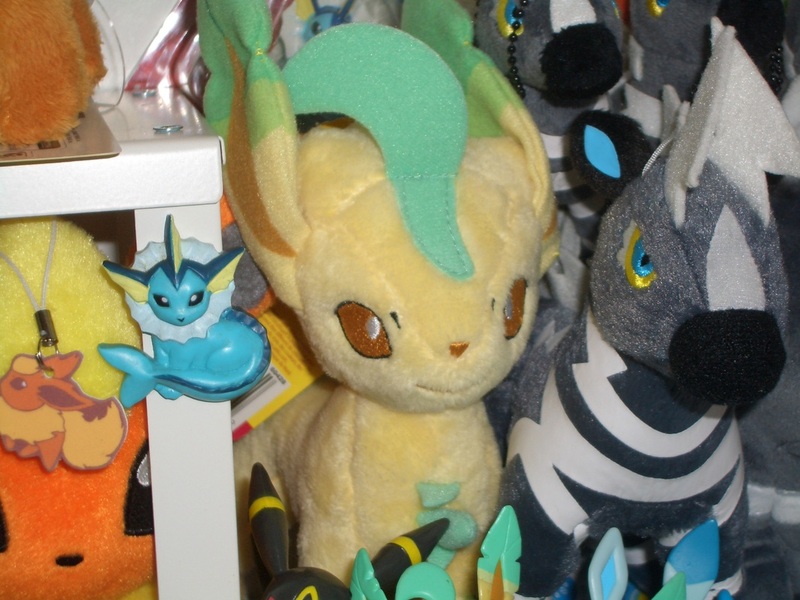 Speaking of Vees, there;s a Vaporeon and Flareon in this kids lot I didnt have! 8D; Also, a Dragonite kid I was missing, plus a Quilava I wanted. Slowly that list of items has gone down, and I only have a few things left to gather up from that time period. 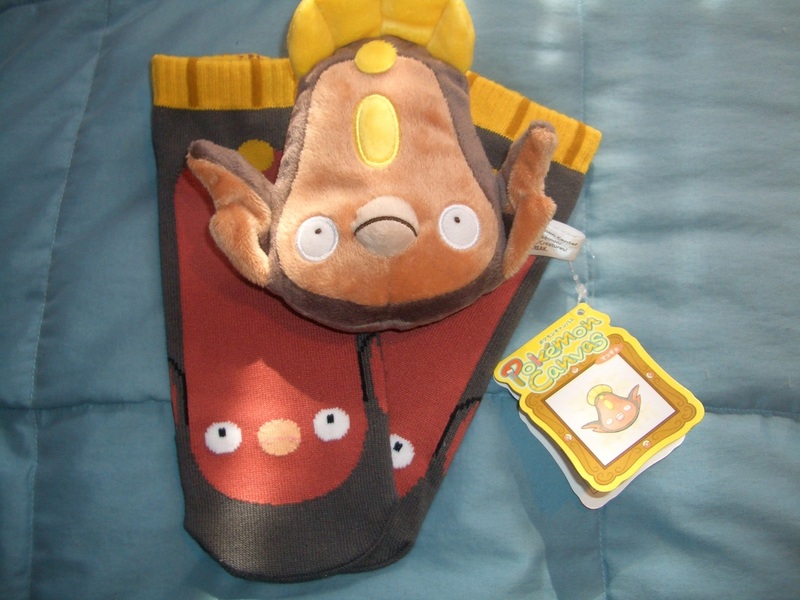 Specifically, a Flareon Canvas plush, Dragonite Pokedoll, Bayleef Johto Dex Charm, Whiscash Plush, and Altaria Pokedoll. I have won a few things this past week though, so its time to share! 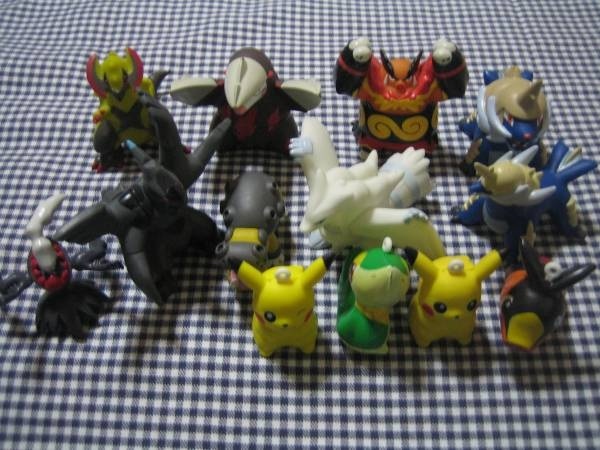 Mystery lot for 1000 yen!! Click the image for a slightly bigger version. The seller has two more pictures listed, but they barely show you much more than what you can see in this picture. 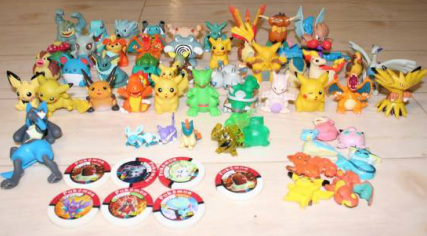 I've been searching for the Mew vs. Pikachu diorama, and the Pikachu vs Raichu one is super adorable too, so that alone makes this lot awesome! XD At the very bottom of the picture right under those boxes, I think I see the head of a Mew Bell Keychain, an uncommon keychain I don't have yet either! 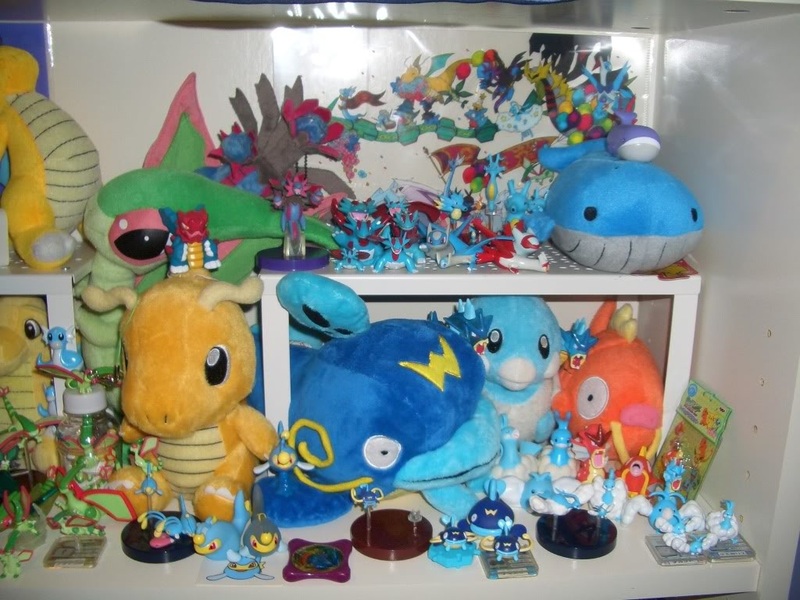 The Onix clock looks amusing, and other than that I can't really identify anything past a handful or magnets and TOMY keychain figures of unpopular Pokemon. Even if the whole thing is a bunch of crap, I love mystery lots so I will have a blast going through it all. How about some Christmas Ornaments?! 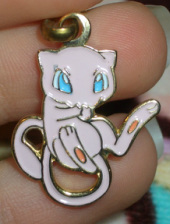 I've been dying to get my hands on the Boot Mew XD It's really cute! I got this for pretty cheap on Y!J to my surprise. I'm really glad the search for this is over. I'll be selling the other ornaments, cute as they may be. Friends plush lot! Not much to say about these, I just bought them to resell lol. I haven't been buying many things off of Y!J recently, because I made a very big purchase! Meet PokeTime Wailord!! This is one massive plush. I love this thing. He's adorable, soft, and very cuddly! I dont collect Wailord at all, but when I saw this guy I just had to get it. If you can find one for a good price, I suggest you get one XD Mine cost $85 shipped. Some of the prices on eBay are already pretty high for it. 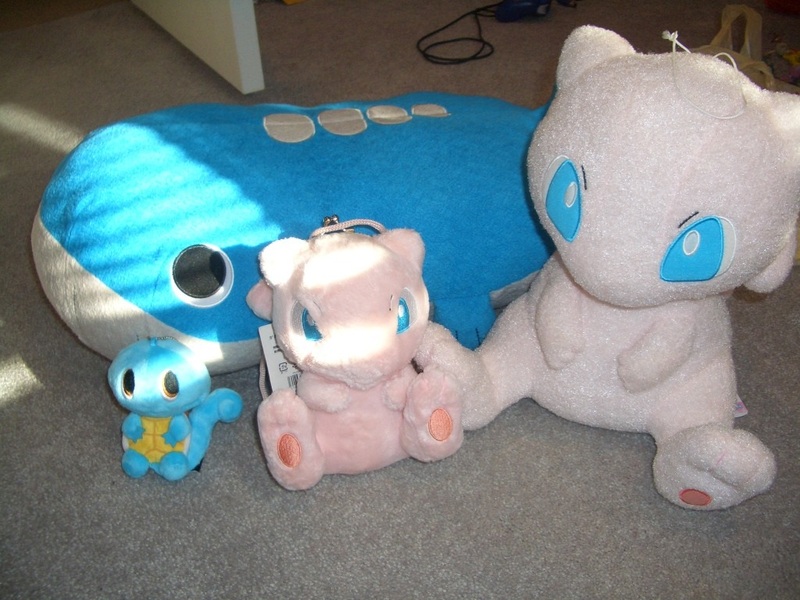 I also got a bowling pin Mew plush! 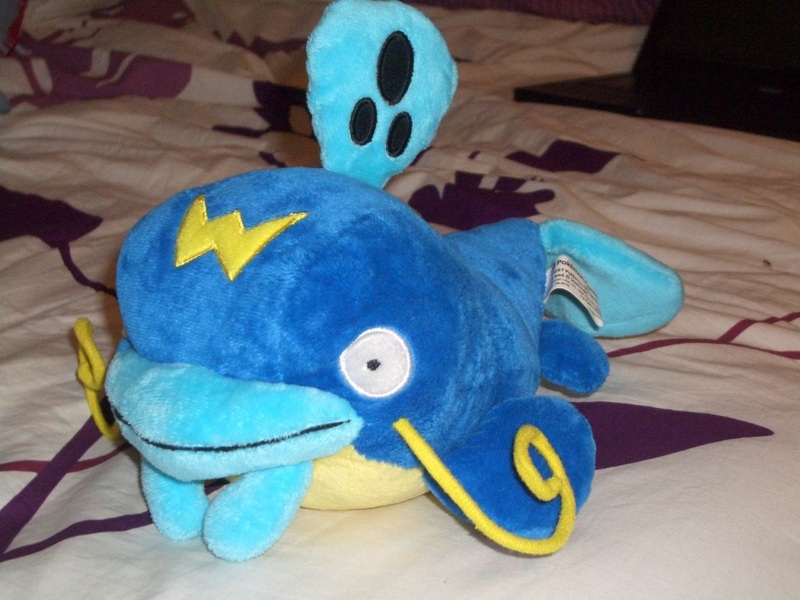 Very cute and soft :) You can see a Blitzle Christmas charm on Wailord's head. I posted a better picture of it in the Blitzle section here! 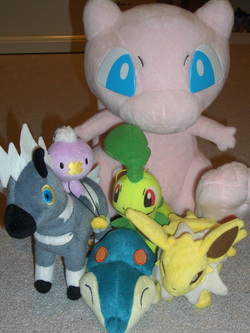 Recent Plush Gets - Group Shot! 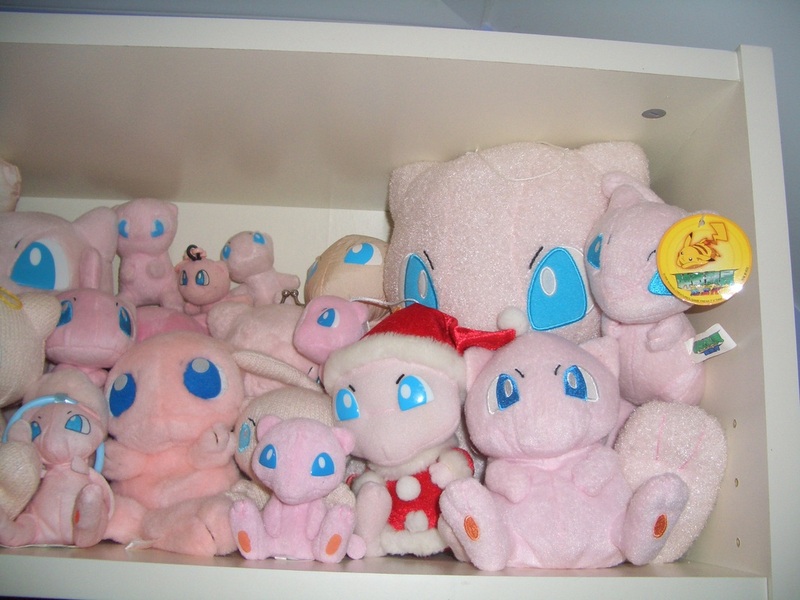 Here are all the plush Ive gotten recently! 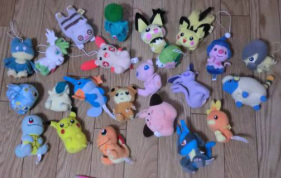 1/1 Mew, TOMY Blitzle, UFO Bayleef, Halloween Drifloon keychain plush, Jolteon Canvas Plush, and a Cyndaquil Pokedoll! A place to record auctions won on eBay and Y!J.